During the warm summer months we may have a spike in temperature in our aquarium and the consequences could be devastating. Thermometers should always be used for every aquarium, regardless of its size. Rapid, significant and frequent temperature changes throughout the day are stressful for fish and the preferred range for the beneficial bacteria in your aquarium is 18-29°C, at 35°C these bacteria may die which can lead to ammonia spikes. A thermometer will also ensure a faulty heater is discovered timeously. Most species require higher temperatures for breeding and this can lead to unnecessary aggression between tankmates, especially with malawis and other cichlids. Warm water speeds up the metabolism of your fish causing your fish to become more active and require more oxygen. Warm water holds less dissolved oxygen than cooler water and is a vital consideration! Fish will initially react to lower oxygen levels by simply moving around less; swim less, even eat less. As oxygen levels drop further, the fish begin to show labored breathing and more rapid gill movement as they as they try to get more oxygen from the water by passing more water through their gills. Eventually this can lead to possible gasping at the surface of the water (this is not be confused with fish feeding at the surface or fish that can normally take some air at the surface, such as labyrinth fish like bettas and gouramis). Live plants use oxygen when not exposed to light, invertebrates, molluscs and even algae consumes oxygen. The beneficial bacteria in your aquarium need oxygen to break down ammonia and with reduced oxygen levels the ammonia in your tank can build up, displacing oxygen and could cause burning of your fish’s gills. It can’t hurt to increase your aeration to assure proper levels of oxygen. The surface of your aquarium is always in contact with the air and oxygen enters the water through a process known as gas exchange (the water in your aquarium exchanges carbon dioxide (CO2) for the oxygen (O2) in the air). The method used to “artificially” increase the surface area of your aquarium is called surface agitation; water movement on the surface of your aquarium increases the surface area and this allows more oxygen to dissolve and more carbon dioxide to escape. You can use an airstone, hang-on filter, powerhead, wavemaker, spray bar, lily pipe or by pointing your filter return at the surface. You can also do water changes more often. Use water that is a degree or two cooler than your aquarium water, this keeps the water temperature down and maintains adequate oxygen levels for your fish. If possible keep the aquarium lights turned off, make sure the room does not receive direct sunlight and remove the canopy (use caution if your fish are jumpers and keep an eye on the cats). A fan can be placed so that it blows directly across the water or float ice packs or frozen bottles in the water. 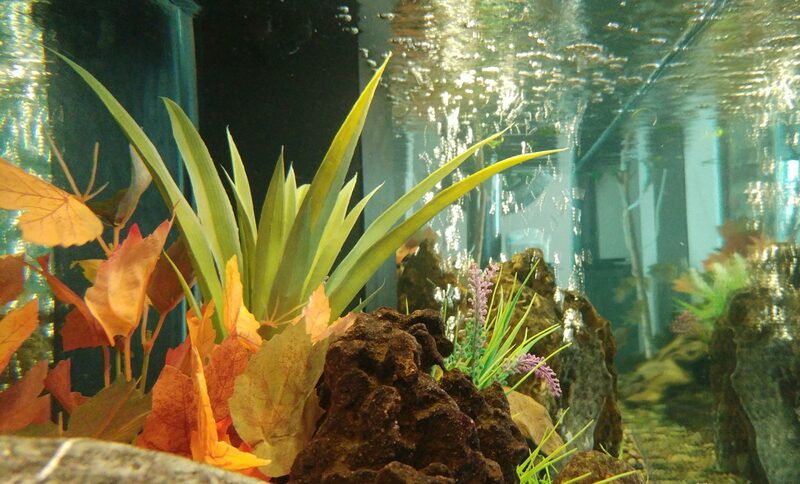 Powdered and Liquid Oxygen immediately adds oxygen to your aquarium water and improves the living conditions. A good supply of oxygen makes the decomposition process more effective and as a result the aquarium remains clear and odor free. Water can only hold so much oxygen before it reaches saturation so no need to worry about too much oxygen. Once saturation is achieved no more oxygen can dissolve in the water. Your fish will happily breathe in water that is saturated with oxygen – it’s harmless. As the warm weather returns so we can expect an influx of various parasites, bacterial diseases and infections due to the pond water rising in temperature. Over the years we have been in various discussions with Koi experts and vets and the consensus is that these diseases and infections are on the rise in South Africa and could be fatal to your entire collection. The three main transmitting factors are air, water and birds. We are not able to control the air born and bird aspects but what we can offer is our tried and tested Spring Treatment. It is extremely important to conduct spring treatments as this eradicates all the parasites that cause those problems e.g. ulcers etc. This keeps your koi in pristine condition during summer with no outbreaks of disease (PREVENTION IS BETTER THAN CURE!). Please note … If you have goldfish in your pond we would NOT suggest the spring treatment. The Fluke Away may kill them. Acriflavin & Salt (3% – 3kg per 1000L) is a good alternative Treatment for goldfish ponds. Pristine is a non-toxic, non-pathogenic, bio-friendly pond treatment of beneficial bacteria for both the filters as well as the immune system of your koi. It re-seeds the biological filter as well as reducing ammonia and nitrogen levels. To salt, or not to salt? Salt is a generic name usually referring to sodium chloride, but more broadly any ionic compound and essential to life on Earth! There are a lot of misconceptions about the various salts available for aquarium use. Table salt is nothing more than Sodium Chloride (NaCl) which comes in iodized and non-iodized forms and has unspecified anti-caking agents and other chemicals such as iodine. Non-iodized salt may or may not be the same as aquarium salt (it depends on the brand). Aquarium Salt is very similar to table salt in as much as it is made of Sodium Chloride (NaCl) however it lacks anti-caking ingredients and iodine. Epsom Salt is Magnesium Sulfate (MgSO4). – Osmotic pressure can be best described as the water trying to dilute the fish’s body until both sides are equal. Freshwater fish therefore have to constantly eliminate the water through respiration and urine. Stress protecting additives aid this function but if salt is used, 1 teaspoon per 1900 litres is sufficient. Salt does not evaporate! It can only be removed by water changes. Plants will not survive higher concentrations (the lethal point for plants is reached at about 1000 mg/l of salt and one teaspoon of salt equals approx. 5500mg). It does interfere with the osmotic regulation of fish and plants and we suggest it should be left alone! Nature regulated that part herself; by creating freshwater, brackish and saltwater fish. The low beneficial amount of salt will not have any benefits in addition to water conditioners and/or stress coats already used for water treatments and because of the potential hazards to the health of your fish and plants we do not recommend the use of salt in freshwater aquariums. There are several species of freshwater fish that do not tolerate salt (it has been said some may tolerate up to 1ppt of salt for short periods but it will ultimately cause undue stress). These include Corydoras catfish, Plecos, Tetras (some species are particularly sensitive), Elephant Nose, Black Ghost Knife Fish, Tiger Barbs, Otocinclus, Ram Cichlids, and Wild Discus.